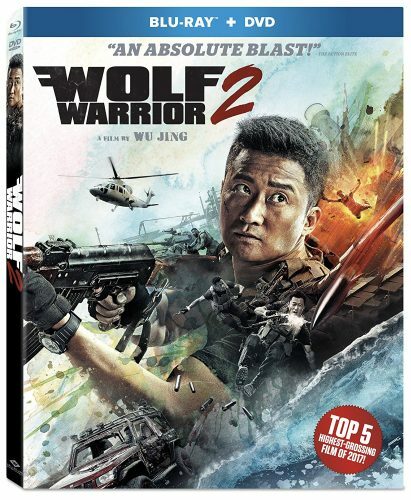 The Wolf Warrior is back, bigger and badder than ever, in this action-packed sequel to the 2015 blockbuster hit. With his career in tatters, China s deadliest Special Forces operative has settled into a quiet life on the sea. But when he crosses paths with a sadistic band of mercenaries terrorizing innocent civilians, he must reaffirm his duty as a soldier and save the day once again. Fists (and bullets, tanks, missiles and much more) will fly in this adrenaline-fueled tour de force of bravura action filmmaking, all culminating into a climatic battle between the Wolf Warrior and the mercenary leader (Frank Grillo, Captain America: The Winter Solider and Captain America: Civil War). Wolf Warrior 2 is a Military Action film filled with heart. Wolf Warrior played by Wu Jing is back and he wears a Bullet around his neck that reminds him of the death of his Girl Friend. Finding the person or person who killed her isn’t the only Mission. The Film Starts out with the Wold Warrior bringing back the ashes of a fallen solider whom died in the first film. He is greeted by a sad family but also a guy who is trying to destroy this family home. Only way to deal with it is to end him. Wolf Warrior now has been DE-badged and sent to prison. Once out he finds him self in Africa during a civil war. And Now he is deeply involved in saving the innocent. The Story is much more than what I wrote above and has a few more roadways the plot rolls on. The story was good and a great follow. Its a tad long and you might find a slow spot. For me I didn’t mind as he just builds up Wu Jing. Action wise we have a ton. Lots of explosions, gun battles and some hand to hand. The best action portion was the 20 to 40 minutes of pure action at the end. What was also cool as that in that portion we got some tank on tank action, tank on Wu Jing Action and a final fight that creates a lot of emotion sadness and anger thanks to the story and a ton of unarmed men women and children getting shot up. It makes you root to Wu and the Capetian on the battleship. A few down sides I can think of was some of the CGI blood splatter towards the camera I could have done with out as it was pretty fake looking. Missiles lunches did look fake too but understandable. Overall I enjoyed the film a little long but I felt a lot of different emotions and the action was great and worth the view in it self. The Film is tactical Geared out. It’s not a 5 star film but its a must have in my books. Pick it up. With that said I give this film a 4.5 out of 5. Cant wait to the next one. Action was top-notch and had a bit of everything and things I haven’t seen yet.